Sim Jae-duck is probably the only person in history who was born in a toilet, lived in a toilet, and died in one, too. Here’s his fascinating story. In 1996, FIFA, soccer’s international governing body, awarded the 2002 World Cup to co-hosts South Korea and Japan. It had taken decades for South Korea to rebuild after the Korean War (1950–53), and the country had only recently emerged from nearly 40 years of brutal dictatorship. 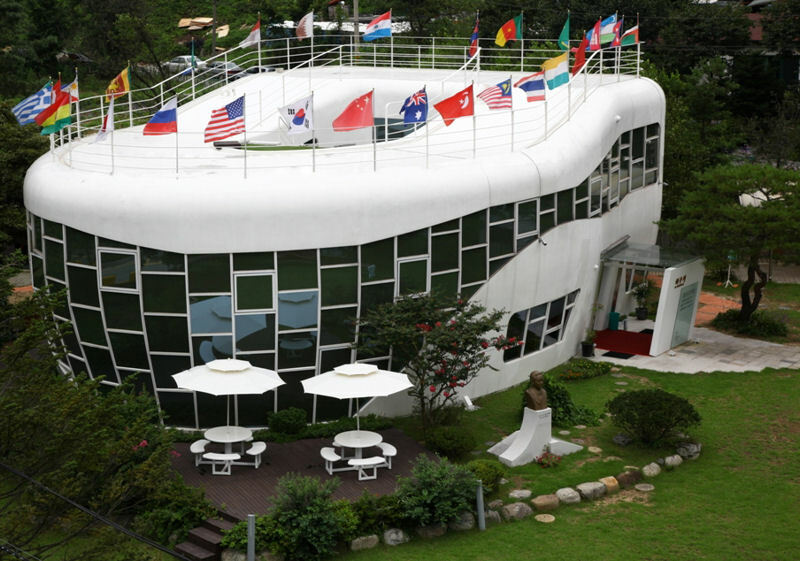 Not many people thought of it as a tourist destination, and hosting the World Cup offered a chance for South Korea to present a new face. Suwon had more than 700 public restrooms scattered around the city, some operated by the city and others provided by private businesses. Mr. Toilet upgraded them all, providing fresh coats of paint, installing artwork, replacing old fixtures with new ones, and piping in soothing music and perfume-scented air. (He also switched traditional squat toilets to sit-down toilets that Westerners were more used to.) Sim also built more than 30 brand-new restrooms and spent so much money on their design and construction—the restrooms closest to the stadium, for example, were shaped like soccer balls—that 26 of the facilities were designated as tourist attractions in their own right. Mr. Toilet may have literally been born for the job. South Korean toilet humor is as bawdy as it is anyplace else in the world (which might explain Korean proverbs like “Toilets are like mothers-in-law: the farther away the better”). But tradition also has it that bathrooms are lucky places. Sim’s grandmother was so sure that anyone born in a bathroom was destined to live a long life that she convinced Sim’s mother to give birth in hers. Sim’s mom went through her labor just outside grandma’s bathroom, and when the moment of truth arrived, she stepped inside just long enough for the future Mr. Toilet to pop out. Improving Suwon’s restrooms proved so rewarding that Sim decided to expand his efforts. In 1999, he created the Korean Toilet Association to push his modernization drive nationwide. Later, he joined the World Toilet Organization, a group dedicated to improving public access to bathrooms around the globe. Then, when Sim concluded that the WTO wasn’t effective enough, he broke away to form his own World Toilet Association in 2006. As Mr. Toilet campaigned for better bathrooms, he came to believe that some of the taboos associated with toilets were barriers to the improvements he was trying to achieve. That’s why, in 2007, he decided to tackle the problem head on (so to speak), by demolishing the house he’d lived in for 30 years and replacing it with one shaped like a giant toilet. The most prominent feature on the main floor is—you guessed it—a toilet, one of four inside the Mr. Toilet House. This bathroom boasts a floor-to-ceiling clear-glass door that seems to offer no privacy at all. But as soon as a person enters the bathroom, the same electronic sensors that lift the toilet lid and turn on the soothing music also cause the bathroom door to become opaque, giving the user all the privacy he or she needs. The bathroom opens directly onto the living room, which features a grand staircase that leads to the second floor and the roof balcony, where visitors can peek out over the rim of the Mr. Toilet House. The Mr. Toilet House has solar panels to reduce its carbon footprint. It collects rainwater from the roof and stores it in a tank until it’s needed to flush the building’s ultra-low-flow toilets, which use 70 percent less water than ordinary toilets. The house even treats its own waste water. The Mr. Toilet House was completed in November 2007, but before Mr. Toilet and his family moved in, they offered to let anyone spend a night in the house, in exchange for $50,000 in contributions to his toilet-related charities. No takers, but for $1.00, Mr. Toilet offered to let admirers take a quick peek inside (and, if necessary, use the toilet). He raised quite a bit of money for his toilet charities with that offer. Though Sim was certainly public in his promotion of “Toilet Culture,” as he called it, there were parts of his life that he kept private. Few people knew it at the time, but even as he was building the Mr. Toilet House, he was battling prostate cancer. It was a fight that he would not win: Sim only lived in his giant toilet for about a year before succumbing to the disease. He died at home in the Mr. Toilet House on January 14, 2009. At his request, his family agreed to preserve the home “as a symbol of South Korea’s new toilet culture” by donating it to the city. In October 2010, the Mr. Toilet House reopened as a museum dedicated to Toilet Culture. Two years later, the city developed the surrounding land into a Toilet Culture Park, featuring exhibits that show the various ways people went to the bathroom before toilets were invented and a gift shop that sells toilet- and poop-themed souvenirs. A sculpture garden filled with statues of squatting men, women, and children also features a reproduction of Rodin’s The Thinker sitting—of course—on a toilet. In its first four months, the Toilet Culture Park attracted more than 40,000 people, and at last report, it was still drawing huge crowds every month. But perhaps the greatest honor to Sim Jae-duck’s memory is the fact that the Toilet Culture he created in the city of Suwon is sill thriving. The city spends $14 million a year on its 100 “flagship” public restrooms—that comes to $140,000 per restroom per year, or nearly $12,000 per month. The immaculate restrooms of Suwon—which to this day bills itself as a “Mecca of Toilet Culture”—must be experienced to be believed. Electronic displays tell visitors which stalls are free, and along with the ubiquitous artwork, soothing music, and perfumed air are “etiquette buttons” that produce pleasant noises when they’re needed to cover…less pleasant ones. Those tiny urinals in the ladies rooms? They’re for mothers with little boys. Some restrooms have floor-to-ceiling windows inside each stall that provide a view of a beautiful bamboo garden beyond; the garden is walled off from the outside world so that it can be enjoyed without fear of anyone peeking into the toilet stalls. This article is reprinted with permission from Uncle John’s Perpetually Pleasing Bathroom Reader. Open up to any page and you may find an interesting origin (like the origin of the snowglobe) or a piece of obscure history (like the true story of the man who tried to repeal the law of gravity). You’ll also find weird news, urban legends, brain teasers, classic riddles, bizarre headlines, and of course, the incredible factoids at the bottom of each page.